My rainbow gazpacho, an easy-to-make chilled soup, comes out a different blend of colors each time I make it. I keep a batch of this in the fridge and we can snack on it all week long during summer. It’s a perfect low calorie, low fat and low sodium treat. Don’t worry if your ‘looms are a little soft because they ripen quickly. The other vegetables provide enough “crunch” for texture. To my taste, the soup needs no added salt. I spice up my bowl with an extra squeeze of lemon and a dash of Sriracha. Caterpillars ate my dill when I wasn’t looking, so I threw in a handful of chopped basil. Parsley works just as well, whatever fresh herbs are available in the garden or look good at the market. This gazpacho will last a week in the fridge. I frequently add a little more vegetable juice after a couple days, as the cut-up veggies keep absorbing the liquid in the soup. 1. Using a food processor, chop first the tomatoes, then the peppers, next the cucumber and finally the onion. Combine all the chopped vegetables in a large, non-reactive bowl. 2. Next, chop the garlic and fresh dill in the processor. Add to vegetables. 3. Pour in the vegetable juice and stir to combine. 4. Add the olive oil, vinegar, lemon juice and mix in well. Taste and adjust seasoning. 5. Chill several hours before serving. Gazpacho is my favorite meal in this heat. I love the rainbow colors! Me too – and it is so hot compared to the down jacket weather of one week ago in Alaska. It seems to improve as the soup sits in the fridge for a few days. I love the look of this soup Liz! Sorry you are not feeling perky, hope you feel better soon 🙂 I am bookmarking this one to try soon, our weather crys out for cold soups. It is a great summer diet/healthy food, especially with the low-sodium V8. BTW I love the changes to your blog!!! I noticed there was something different – your photo of the gazpacho really jumped out at me. And you kept my favorite photos of your family. I love it!! Susan, dear friend, I so needed to hear this – thanks! Hope the reunion in Chicago is/was a blast! Wow! This gazpacho will replace mine as it is easier, lower in calories and sodium, and more delicious. I did have to use red wine vinegar as usual for gazpacho since I was out of cider vin. This must be shared, so my office mates are really in for a treat tomorrow! Two of my kids love soup – I wonder how they would feel about a cold soup? And I agree with Greg – you can’t add too many herbs! Somehow, I’m not certain kids would go for this – unless they really like salad – it’s like a liquid salad. Gazpacho is my favorite. What a lovely recipe, Liz. Feel better! Thanks, Carol, and sorry to be out of touch. I have been ill since we got back from Alaska 10 days ago – bad bug. Will catch up on your posts over the weekend, always lovely. Liz, Have to make this tonight! Perfect for Meatless Monday – thanks for an outstanding recipe! 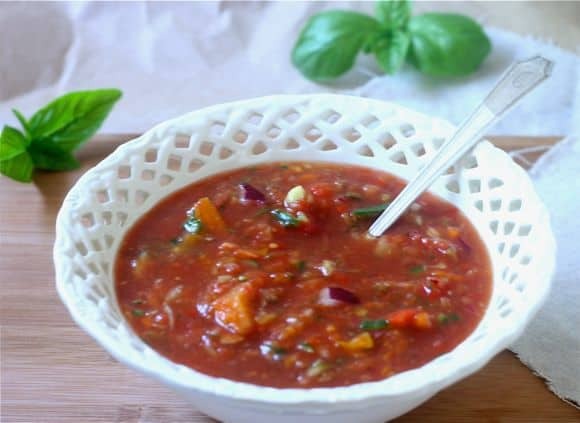 Hey, Mary, thank you – this hot weather is perfect for gazpacho.